Today: Seattle at Oakland, 1:05 p.m.
SEATTLE – Don Wakamatsu didn’t call out Felix Hernandez late Sunday afternoon, although the Seattle Mariners’ manager might have considered it. 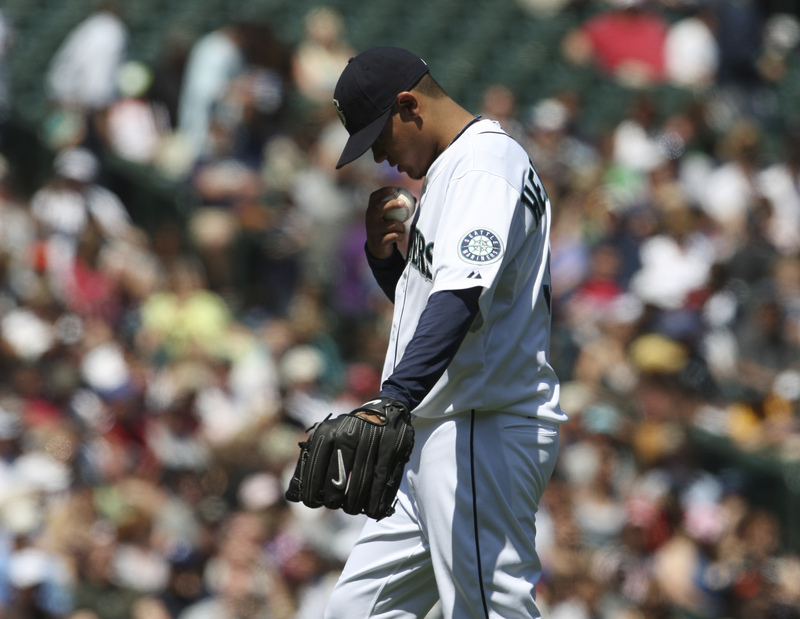 Hernandez pitched seven strong innings, and one shaky one, to lead the Mariners to a 5-4 win over the San Francisco Giants. Afterward, Wakamatsu may have been tempted to attack Hernandez again – not for the 23-year-old starter’s fifth-inning struggles but because of the way Hernandez responded to his last public dress-down. Sunday marked Hernandez’s first trip to the mound since Wakamatsu called him out five days earlier. The public comments seemed to light a fire under Hernandez, who responded with a solid performance for most of Sunday afternoon. A motivated Hernandez was dominating for the first four innings of Sunday’s game, allowing just one hit while throwing first-pitch strikes to 11 of the 13 batters he faced. His performance was more representative of the Hernandez in April (4-0 with a 2.38 ERA) than the May version (0-3 record and a 6.75 ERA). Hernandez took a 2-0 lead – thanks to Ken Griffey Jr.’s two-run homer in the bottom of the first – into the fifth inning before falling back into his May habits. A wild pitch, a walk, and three consecutive two-out singles gave the Giants a 3-2 lead. But the Mariners’ offense ignited again in the bottom of that inning, behind an unexpected power source. Adrian Beltre hit his third home run of the season, a three-run shot that gave Seattle a 5-3 lead. Hernandez gave up another run on Fred Lewis’s solo homer with two outs in the eighth, but closer David Aardsma closed the door in the ninth – thanks in large part to a nice Ichiro Suzuki catch in foul territory – to assure Hernandez (5-3) of his first victory since April 28. Hernandez gave up seven hits and four runs – only one earned since there was an error in the middle of his fifth-inning struggles – while striking out a season-high 10 batters over eight innings of work. He threw 112 pitches, 83 of which were strikes. Just as satisfying was a rare series win, marking only the second time Seattle has done that since May 3.